G. Harvey paints the American cowboy and the iconic West as no other artist can. 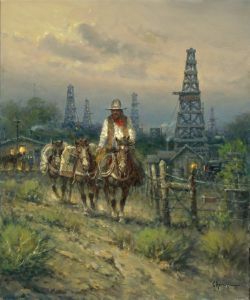 In the artist's latest release, the oil derricks and the cowboy come together in one of the artist's most collected subjects. This outstanding image will be very popular with all your G. Harvey collectors.